PSEB 10th Class Result 2018 are announced by Punjab School Education Board. The Board announced the 10th Class (Matriculation) results of exam conducted by 2018. Students from Punjab can check their Matriculation results on the official website of PSEB. The Punjab Board Class 10th Matriculation examination was held from March 12-March 31, 2018 and the results are out now. 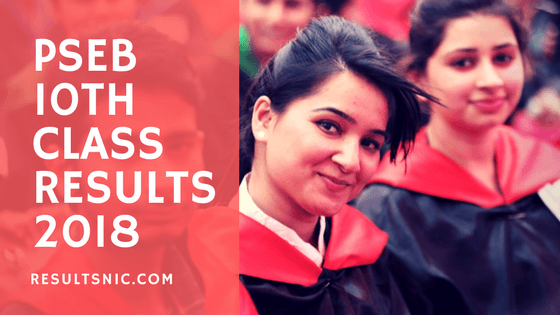 The PSEB had announced the Punjab Board Class 12 results 2018 on April 23 on pseb.ac.in. In 2018 over 4.5 lakh students have appeared for the PSEB class 10 examination. The PSEB 10th Class results are available now. Students can check their result on the website given above. Last year, the PSEB 10th Class Result Pass Percentage was 57.50% and for the PSEB 12th Class Senior Secondary exam was 62.36%. The PSEB has already begun the facilitation of the application process for re-evaluation of the answer sheets of the students who appeared for the PSEB Class 12 Exam 2018. Students who want to apply for reevaluation of their answer sheets can log on to the official website and fill in the forms till 11th May 2018. The students will have to pay a fee of Rs 500 per subject as the fee through a challan. After filing the forms and paying the fees online students will have to submit a printout of the challan to the board’s regional center in their respective districts. In the below table, students can check the previous four years Results with pass percentage. In 2017 the overall pass percentage was much less compared to previous years.